Climate change research has often been criticised for focussing on abstract impacts far into the future that are not perceived and understood in the context of daily life. This case proposes the use of life history interviewing as a methodological approach to study how people perceive and negotiate multiple risks to their lives and livelihoods in highly dynamic contexts such as semi-arid regions. This paper is a methods teaching case which means it can be used by students to understand how to conduct life histories when trying to study vulnerability in complex social-ecological systems. 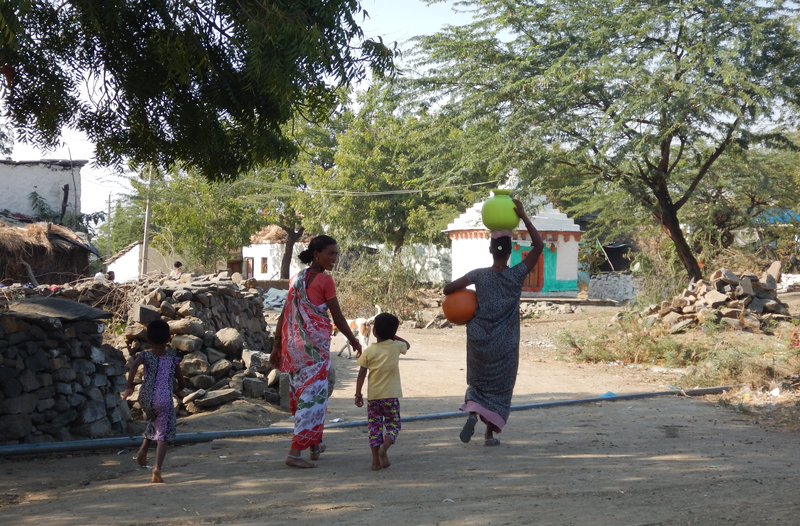 The paper discusses how life histories were applied to understanding temporal vulnerability and livelihood decision-making in a semi-arid context in India. You can also find out more about the life histories approach in this How-To Guide on Conducting Life History Interviews (also available to download form the right-hand column). What was done and what was novel? This paper examined vulnerability to climate change at household and intra-household levels to uncover how personal attributes such as caste, age, and gender, as well as contextual factors such as reduced natural resources and socio-political trajectories shape people’s daily lives, their livelihood choices, and aspirations for the future. The novelty is that usually livelihood decision-making and vulnerability is studied as static; and the tools to measure them are typically snapshot, survey-based ones. The teaching case demonstrates how life histories offer a nuanced, dynamic picture of people’s lives and livelihoods. The case shows the usefulness of life histories in providing additional methodological tools to social scientists working on climate change vulnerability. This method of research is able to develop better understandings of livelihood decisions, the motivations for livelihood choices, and the dynamic relationship between livelihood choices and the immediate and larger environment of households. Life histories are also able to demonstrate how social demographics and local contexts shape the livelihoods, decisions and ambitions of households. Life histories are a reliable method to develop contextual, detailed understandings of how people perceive, respond to, and live with climatic and non-climatic risks. It also allows the researcher, to identify transitions and trigger points along a family or person’s life, thus potentially identifying entry points to behavioural change. In adaptation research, such insights into decision-making are critical because behavioural change toward more sustainable, climate-sensitive actions is a slow, often intangible process. The practice implications of this research include the ability of life histories to supplement typical survey-based assessments to capture change and livelihood and adaptation pathways. Life histories could also be used for more effective and inclusive approach to monitoring and evaluation, when used in conjunction with other methodologies such as Stories of Change. Creating an understanding of the ways in which different households respond, particularly in terms of the adaptation pathways they assume, can be captured through life histories. This understanding could help to inform development policies intended to change behaviour, through targeting the correct stakeholders and the correct times.